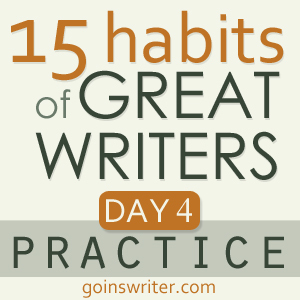 Real writers practice. They show up, every day, without excuse or complaint (okay maybe some complaint). This is the work of a professional. I’m not talking about rehearsal. I’m talking about doing what musicians and boxers and lion tamers all do in order to get ready for their work. To become awesome at their crafts. They practice, and they do it in public. 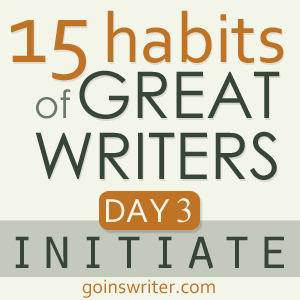 Yesterday, I challenged you to believe you are a writer — maybe for the first time, maybe for the fiftieth. We all need reminders, regardless of where we are in the journey. I told you there would be a time to act. That time is now. It’s time to start writing, and I don’t care if you’ve written your whole life. Today is different. It’s time to start again. Belief is something you can feel, touch, and taste is one thing. Faith is another. If you’re going to succeed, you’re going to have to believe you’re a writer — in the deepest core of yourself. That part of you that you’re scared to share the world. You’re going to have to trust in what you can’t yet see. 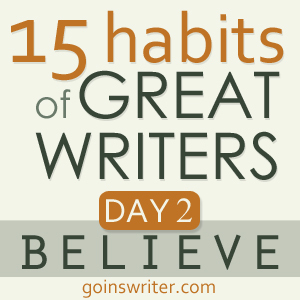 Today, you need to do something bold to believe that you’re a writer. Because until you do this, you’re only kidding yourself. What is it? You have to trick yourself.